The Personal Barber are a subscription company that offer boxes of goodies to help you have the perfect shave. With an eye on the perfect Father’s Day present, I was sent a box from The Personal Barber to check out what such a gift would provide. The box contained a sturdy safety razor and a beautiful shaving brush to get you up and running. This traditional, Portuguese, long-lasting soap has that distinct glycerine smell. The slickness it leaves on the face makes a perfect bed for the shaving lather to be applied onto. Russian razor blades, no less. The Superior give you 3 – 6 shaves to practice your technique, then it’s onto the Perma-sharps which last longer. You’re not using cans of shaving foam here. The authentic shaving experience involves using the brush to lather up your own foam on your face, in your hand or in a bowl. The bergamot scent adds to the experience with its light, refreshing smell. It’s lathers up a treat so that even a brush beginner like me can get a decent foam going. Made in the UK, but Portuguese by design, this all natural moisturiser is easily absorbed and has a pleasing cedarwood scent. Simply massage into your face and neck and you’ve done your skin a massive favour! 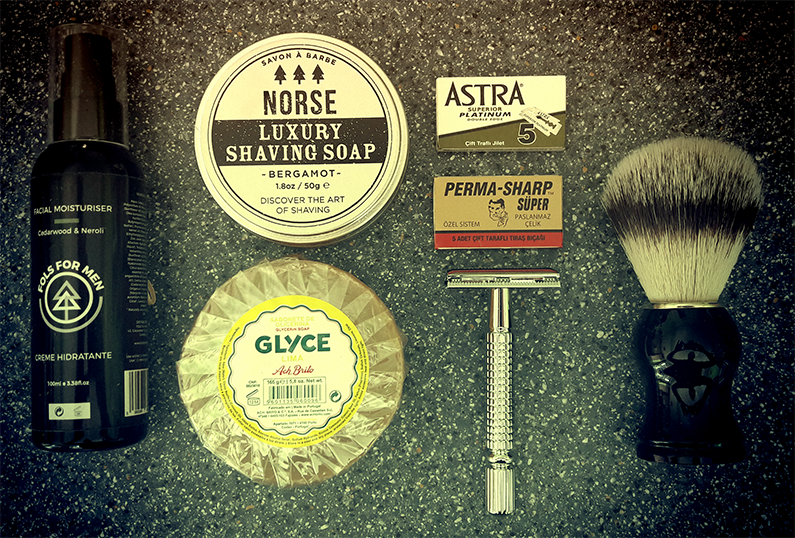 The guidance that comes in the box gives lots of details about the products within along with detailed advice on how to achieve that perfect shave. Up until I got this box, my shaving routine was pretty much disposable razors and canned shaving foam, shaving blind in the shower. This box has changed that completely. The whole shaving experience is now very different. The smells of the quality products are very satisfying. The process of making foam from the soap and applying with the brush is more pleasing that squirting it out of a can. It’s more personal. More enjoyable. The end result is a shave that’s far closer than the disposables could achieve. I have quite a heavy growth, but it still feels like a fresh shave the next day. I’m completely converted. I can’t go back to taking less care of my face having experienced this way of shaving. I am very impressed. Would this make a good Father’s Day present? Absolutely! It screams quality, and practically tells the fella to go and spend some time treating himself. Highly recommended! The Personal Barber are offering one lucky sausage the chance to win a starter box like the one reviewed above. Simply enter using the widget below before midnight on Sunday 10th June (week before Father’s Day) to be in with a chance. 2. THE PRIZE IS A GIFT BOX LIKE THE ONE ABOVE FROM THE PERSONAL BARBER. 3. ENTRANTS MUST BE 18 OR OVER AND RESIDE IN THE UK. I once got my Dad one of those driving experience days. He loved it. I think the best presents are the ones you make yourself. Its been a long time since I’ve done that – but I do remember making a picture scrap book of family photos when I was a child that went down well. A wooden carving made by my son. A trip to Ascot for my 21st. What ever the present keep it simple! My Dad is the easiest person in the world for Father’s Day. He just loves to be treated to a bottle of whiskey and his pleasure every time makes every present the best ever. It was a keyring and I use it everyday. I once bought my father a tablet, he barely uses the internet but I spent my time teaching him, he really valued it. I remember getting a coffee machine and some fancy coffee beans. Absolutely perfect for me! I got my dad tickets to see Rod Stewart….he was so happy ! I once gave my Dad some personalised golf club headcovers. My Grandad was the closest thing I had to a father and he did an amazing job. We lost him to cancer last year which has been hard for all the family. He WAS the gift; the best thing God could have given us. I think the best present was always making sure my kids made a fuss of their dad on fathers day. Iv got my hubby tickets to see Grease the musical from the kids at our local theatre this year! he loves grease so cant wait to surprise him with them! I think my father most enjoyed his gardening tools gifts from us. I once got my dad tickets to see Iron Maiden (one of his favourite bands) in concert. A set DeWalt power tools! I gave dad a wallet when I was 10 that he used until the day he passed away – still means a lot to me. My best was a handmade card from my son, it was rubbish but he’d taken hours making it so it was special. One year I got my dad an iPod touch & had a nice message engraved into the back. He was over the moon with it! I got my Dad to drive a steam locomotive! I actually don’t know where my dad is so can’t really get him anything this year. This will be my first fathers day, I’ll keep you posted! Bought my dad a very expensive watch one year – he was most grateful!! Unfortunately my own Dad died suddenly when I was a child. For my brother to share his joy at receiving gifts (tokens of love :- Sharing Sweeties, etc) has been delightful. Now that Fathers Day is recognised and Celebrated more :- I love, as allows us to Celebrate past and present positive aspects of Fatherhood. Community Events can be delightful. I like to gift, Celebrate, acknowledge, etc.